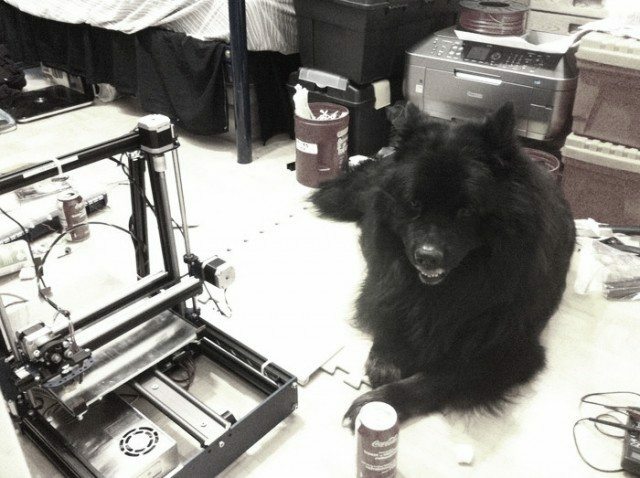 Dzamba’s dog, Atos, sits beside a prototype of the PetBot. Misko Dzamba and his furry friend are onto something. Since last March, Dzamba, a masters student at the University of Toronto, and his dog, Atos, have been perfecting the PetBot. Concerned that his furry friend would be at loose ends and unsupervised during the hours he wasn’t home, Dzamba built him a robot companion—one that allows the inventor to monitor his pet and reward him with biscuits. But Dzamba’s not done perfecting his creation: over the holidays, he’ll be testing a newer version of the PetBot that will be smaller, cheaper (around $100), and made of sleek steel. “We’re on track to launch this January,” he says, and he hopes to start delivering the PetBots by February. This month, Dzamba’s Kickstarter failed to reach its intended goal of $20,000 to help pay for materials and fund an improved redesign, although slightly over half that amount was raised. Dzamba says the money pledged will still go toward the PetBot, and that people continue to show interest. The project was featured, for example, by Spotlight on Startups series at U of T, which profiles companies that have been started at the university. The primary purpose of the project for Dzamba and his crew, though, is still to understand and meet the needs of animals. And Dzamba is quick to credit the contributions made by his very own animal assistant. Check out the Kickstarter video to see how PetBot works.